Little furniture has survived from these later periods. During the Third Intermediate Period the administrative capital of Egypt moved to Tanis in the Delta, where the royal tombs of the kings of the Twenty-first and Twenty-second Dynasties were located. These small tombs were discovered virtually intact by Pierre Montet in 1939. They contained no furniture and their wall scenes are mainly funerary in subject matter; they do not show the everyday activities performed as part of normal life that are seen in earlier tombs. An exception to this general rule is to be found in the tomb of Petosiris at Tuna el-Gebel, which dates to the regency of Philip Arrhidaeus, 323-305 BC, in the Graeco-Roman Period. Here the fine series of tomb reliefs have been freed from religious content. These scenes show furniture similar to that of previous dynasties, with the addition of a folding table, on which a carpenter works with a bow-drill, and a type of lattice or wicker chair. chisels. No evidence has been found to suggest they used hollowed blade gouges. Turned material soon became widely used to make the legs of chairs, stools and beds. 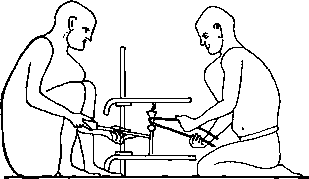 At first the technique proved difficult on the light lathe illustrated in the tomb of Petosiris. Soon heavier and more rigid lathes allowed turners to produce quality material in a large number of complex profiles (figure 63). 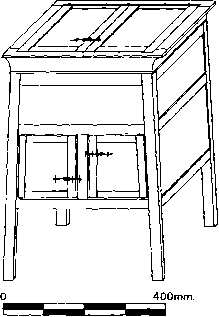 Cabinet-makers at this time were producing quality chests (figure 64). Designed upon a splayed frame with rebated panels, they had pairs of opening front and lid doors. By the Roman Period, Egyptian homes would have been furnished with a number of pieces of quality furniture. Tables, stools and benches would have been a common feature. However, the couch, which was fashioned with turned legs and was finely upholstered, was also used in Egypt. Many examples of turned couch leg (figure 63) survive in museums around the world. These couches would have been inlaid with ivory and bone which were carved with scenes of animals, fruits and flowers. Some fine examples of bone inlay strip, from Tanis, are preserved in the Bolton Museum and Art Gallery. Marble was often used to make furniture or the tops of tables, while bronze was cast and made into vase stands. In the Musée des Beaux-Arts, Lyons, is a particularly fine three-legged bronze vase stand which was found near Alexandria in 1773. It was during the Roman Period that carpenters first began using planes and worked on timber prepared over a sawpit. By converting timber in this way it became possible for carpenters to work on boards of better quality and longer length. The art of the woodworker, joiner, cabinet-maker and turner, founded in antiquity, has been continually practised through fifty centuries. From master to apprentice, these ancient skills and techniques are preserved and cherished.